Suppliers of diaries, calendars, pens, clocks, computer accessories, usb gifts, glassware, paper and desktop products, calculators, golf umbrellas, t-shirts, mugs, recycled gifts and all corporate gifts personalised with logo or advertising message. 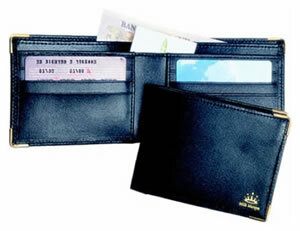 Genuine British made leather gents note case with two bank note pockets and individually lined credit card pockets. Colours: Blcak, Navy, Green or Burgundy.